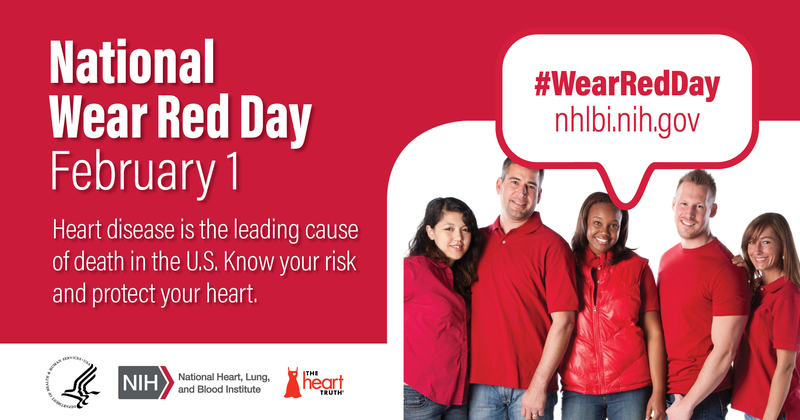 Join NHLBI, The Heart Truth, and organizations around the country on National Wear Red Day, celebrated each year on the first Friday in February, to bring greater attention to heart disease awareness as the leading cause of death for Americans. Use the poster, stickers, and social media resources below to promote Wear Red Day in your community. Print this poster and hang it around places in your community, workplace, faith-based institution, clinic, or other areas to promote Wear Red Day. Print your own National Wear Red Day stickers and hand them out to members of your organization or community. Help promote the observance by sharing the images and sample posts below on your social media channels. Simply click on the image to download and copy and paste the text below. National Wear Red Day. February 1. Heart disease is the leading cause of death in the U.S. Know your risk and protect your heart. Día Nacional de Lucir Prendas Rojas. 1 de febrero. Las enfermedades del corazón son la causa principal de la muerte en los E.E.U.U. Conozca su riesgo y proteja su corazón. We’re proudly joining @NIH_NHLBI and @TheHeartTruth for #WearRedDay to support heart disease prevention and to encourage everyone to move more in 2019! We can think of no better way to kick off #HeartMonth than celebrating #WearRedDay! Join us in the fight against heart disease. Wear red and get at least 30 minutes of physical activity today. Únase el 1 de febrero al día nacional de #DíaLucirPrendasRojas para crear conciencia sobre las enfermedades del corazón. Vístase de rojo y haga la promesa de hacer más actividad física por su corazón durante el #MesDelCorazón. ¡Hoy es el Día Nacional de Lucir Prendas Rojas! Proteja su corazón moviéndose más, comiendo saludable, manejando el estrés y durmiendo bien. 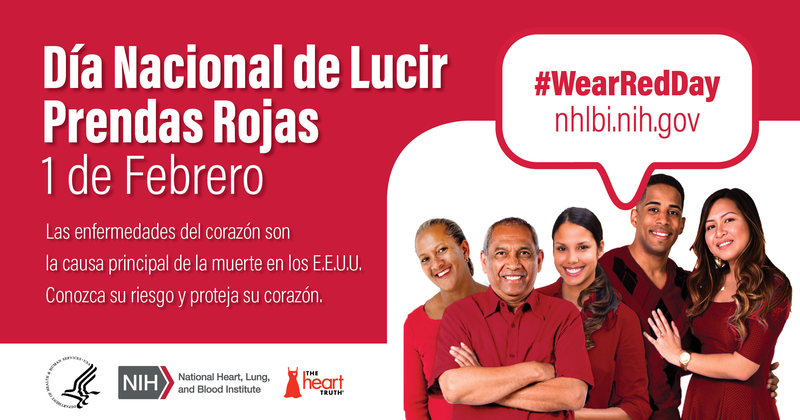 Join us on National Wear Red Day, February 1, to raise awareness about heart disease. Wear red and pledge to be more active to protect your heart this American Heart Month! It’s American Heart Month and today is National Wear Red Day! Add a pop of red to your outfit to show support for heart health. It’s National Wear Red Day! Help us raise awareness about heart disease. Take a selfie in your red gear and share it. You get bonus points if you’re being physically active in your red gear too! For National Wear Red Day and American Heart Month, we’re joining @NHLBI and @HeartTruth to support heart disease prevention and encourage everyone to move more in 2019! Today is National Wear Red Day! Protect your heart by moving more, eating healthy, managing stress, and getting quality sleep. Do you know your heart disease risk? High blood pressure, high cholesterol, smoking, diabetes, obesity, and physical inactivity each increase your risk for heart disease. SHARE this post for National Wear Red Day! We can think of no better way to kick off American Heart Month than celebrating National Wear Red Day! Join us in the fight against heart disease. Wear red and get at least 30 minutes of physical activity today.